When we are learning how to compare numbers, I use Big Mouth with my students every year and they LOVE it! It helps them to remember how to use their greater than and less than signs. 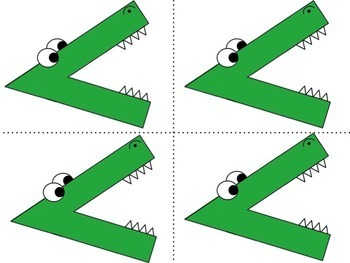 Big Mouth (the alligator) ALWAYS eats the biggest number!! This unit is a great way to learn this concept. .
1. Anchor charts or posters to use with your students as a visual aid. 2. 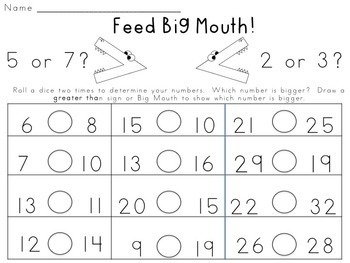 Feed Big Mouth: A game used to practice finding the number that is bigger or smaller. 3. 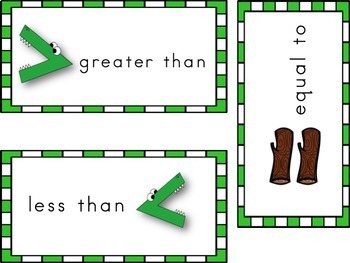 Ten printables that your students can use to practice finding the number that is greater or less than the other number. 4. Vocabulary Cards made with different graphics. 5. 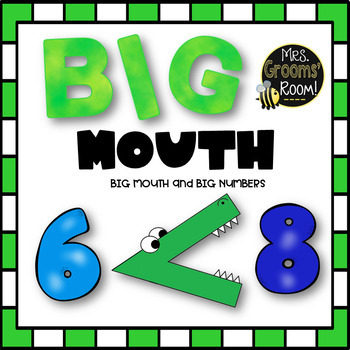 Eating Numbers Around the World: Take Big Mouth around the Room to find those bigger numbers. These task cards can also be used in an independent center.